I read a lot of magazines and they all say that men’s trousers on women is the next big thing. Personally, it’s not my cup of tea. I like my clothes to show off my curves, and these trousers seem to drown out any shape this woman might have. What’s your take on men’s trousers? This pair is from Madewell and will run you $110. I love them! I just don’t think they’d be flattering on very many people, myself included. They’ll probably look best on people who are stick thin. I hate ladies fashions. Men have it much easier – waist and inseam. Women’s clothes accentuate curves. Those with bulges are out of luck or they look like sack of potatoes. I would like to have a pair of trousers with deep pockets, straigt legs, belt loops, back pockets and fully lined. 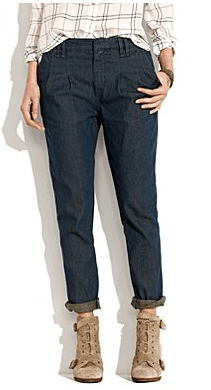 I hate seeing the skinny leg pants made for women – for girls OK – but for women – NOT! I will not buy trousers with no back pocket – its a practical matter. Please, please make trousers practical for women, i.e. deep pockets that things won’t drop out of – so annoying! Relaxed fit is good, straight legs is more asthetic than tapered to ankle. Please make me some practical, good looking trousers. While you’re at it, some nice looking oxford shoes, waterproof, for women, just like those for men.